Again NAOMI has such a good understanding of time travel and can see things from THE PILOT's point of view. The military tattoo barcodes onto its personal in THE PILOT's future. The tracking and bomb activation device that JUNIOR is called a "Memex". The Memex machine was a hypothetical machine proposed by Vannevar Bush (scientific advisor to the U.S. President during WW II) in 1945, which was a desk with two screens and two input devices that would allow people to access text, audio and film-based materials, and create links between different content. 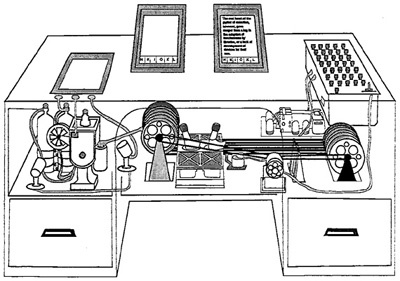 The Memex machine concept strongly influenced a number of computer pioneers, including J.C.R. Licklider (who did important work on Human-Computer interfaces), Douglas Engelbart (who developed the computer mouse, computer graphics, video conferencing, and word processing), and Ted Nelson (who pioneered hypertext and hyperlinks). A Memex is a "MEMORY STORAGE UNIT" here. The radio-controlled bombs have a 50 feet range, just as well.